Subscribe to our alert service for free - to keep you abreast of changes, and new offers as they come to market. For help, in complete confidence, please either request we call you back, email us: info@fundinvoice.co.uk or call Sean Morrow on: 03330 113622. The alternative that best suits you will depend on the issues that you have with using factoring. Too Expensive - not all factoring companies charge the same, we have conducted mystery shopper exercises that have revealed a 49% pricing differential between the top and bottom of the table of providers. On average we can find an average saving of 34% of the fees quoted elsewhere. Switching to a slightly different product can also reduce the fees, for example if you don't need funding against all your invoices there are selective options or you could move to discounting and handle the credit control yourself (see our guide to handling your own credit control). I Don't Want To Give Personal Guarantees - there are some invoice finance providers that will not require personal guarantees, and many will limit the value or the type of PG given e.g. to a fraud warranty only. I Don't Want To Have A Factor Chasing My Customers For Payment - you may want to handle the credit control yourself, in which case there are invoice discounting services that will enable you to do this. Also, there is a product called Confidential Factoring where a factor will still chase your customers, but in the name of your company. Depending on your issue, one of these options might suit you better. I Don't Want To Factor All My Invoices - there are services available, called selective invoice finance, where you can choose which invoices to get funding against - often with no obligation to meet any minimum levels. I Don't Want Any Hidden Charges - some facilities offer a single "bundled fee" which includes all the charges. The amount of additional charges will vary between providers, we can advise you. I Need More Money - funding levels vary between providers. If you need more funding we may be able to find you a more flexible facility, a top up or an overpayment facility. If you have other assets you may be able to raise more money against them e.g. equipment or machinery. I Don't Want Customers Knowing I Use Factoring - again confidential factoring (see above) may be an option or a full Confidential Invoice Discounting service, depending upon whether you want to handle your collections or not. The Credit Control Service I Receive Is Not Good - if your existing provider isn't providing a satisfactory credit control service, there are others that can provide a better collections service. Sometimes it may be a poor credit controller, they may be overloaded with clients or the factor may be operating a system where only the largest debts are chased. We have researched this area and asked existing users to rate their providers service levels. The differential in customer ratings between the top and bottom of our table was 125%. We can point you towards the best. How To Get Out Of Factoring In 10 Steps - a guide if you want to leave altogether. Help Changing Providers - an article about the support that is available to move to another provider. What Stops Users Moving Invoice Finance Companies - our research into overcoming the barriers to moving suppliers. 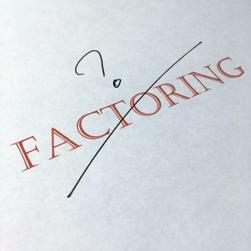 5 Key Differences Between Factoring Companies - an explanation of the differences between factors.